"To promote awareness of solar energy capabilities, and demonstrate appropriate alternative techniques, stressing voluntary cooperation and mutual aid, while working toward self-sufficiency and a world at Peace"
A 'small back-hoe' (donation or low-cost), for the re-build of the SEADS Camp as well as the Passive Solar homes will be needed in the near future. The form on the 'Contact Us' page here will allow you to comment and send questions concerning donating and participation this Fall ! A workshop participant soldering a string of PV cells for a hand-made 65w module. 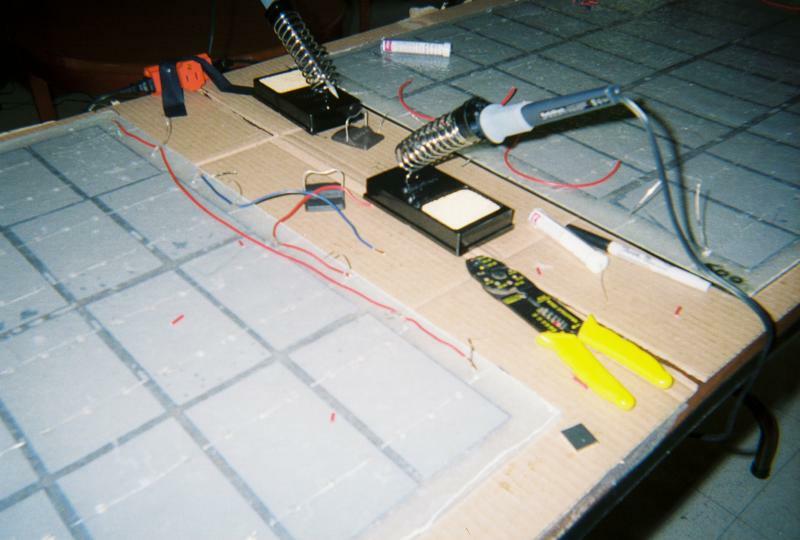 ------------------------------ -A string of 9 PV cells being tested for voltage and amps after soldering. Four strings, ready for 65w PV module encapsulation with liquid Silicon. Two 65w modules, wired and ready for framing. 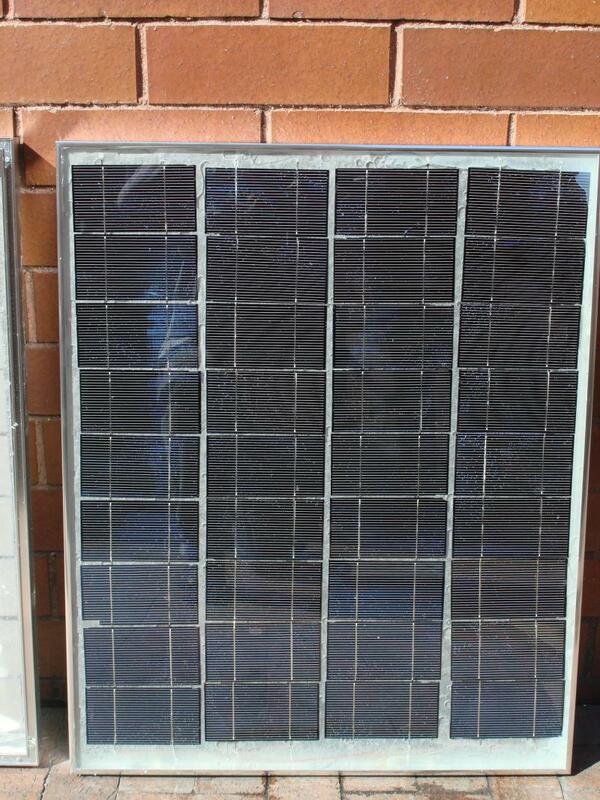 A finished 65w PV module, rear view, framed and ready for testing. Thanks to the do-yourself-solar techniques described above, participants can now become free from the oppressive, polluting, fossil-fuel based 'carbon establishment'. Many folks around the world, with experience assembling these hand-made PV modules, can now start their own business'. Sharing their knowledge with others, and becoming independent, "green-energy" producers, in their communities. Please check the SERVICES page for a supplies list, as well as a step-by-step procedure section, for the "do-yourself-solar" PV assembly process used for the 65W PV modules at MESEA workshops in the USA, and in the PV "cottage industry" programs with the developing world communities. 2013, March, PV Workshop at the Manhattan Comprehensive Night & Day High School, NYC, fifth year with MESEA ! MCNDHS students solder PV cells for the first time, during the MESEA Solar Workshop, assembling a 65 W PV module, to be used at the NYC High School ! 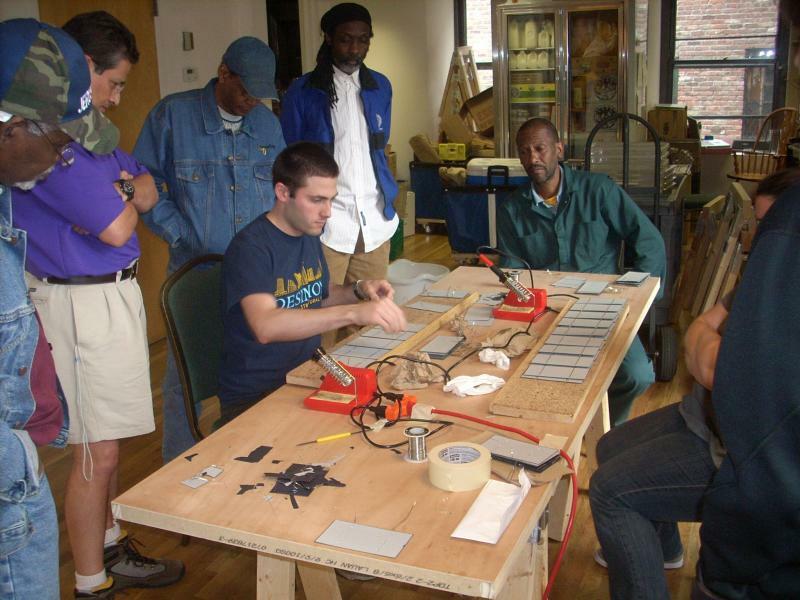 Arlea, David and four students at the March, 2013, MCNDHS, NYC, MESEA solar workshop, ready to encapsulate the four strings for a 65 W PV module ! Dadsolar.com, DADS Inc., working with our sister solar educational corporations, through do-yourself-solar seminar programs, (d.y.s), has been helping people realize self-reliant lifestyles, in many areas of the world, for over 35 years. "Working towards self-sufficiency, small steps to world peace! ", has been a favorite slogan, inviting families and communities, to take the first step away from the petro-chemical addiction, that we all are suffering. So many folks are frustrated, thinking that we can't do more or anything to help the world situation. Even using solar energy for heat and electricity, offsetting fossil fuel expenses and pollution, seems too far from our grasp. How frustrating is our situation? What can we do? We have been working with the d.y.s approach for over thirty years, facilitating the learning process for many hundreds of participants. Our efforts are allowing participants to utilize safe, non-polluting, solar energy. The d.y.s method , simple and easy to accomplish, allows anyone to achieve a degree of self-sufficiency in their life-style, without going broke! In fact, working one step at a time, families can gradually become more and more independent of the polluting, exploiting and expensive, fossil fuel spiral that has the world teetering on the edge of disaster. Those working with this program around the world, (in the U.S., Nicaragua, Haiti, Peru, Mali, India, etc. ), have watched the jubilant faces of those who can experience the great feeling of "a step toward self-reliance". A network of experienced "facilitators", exists now, and can be increased in size and scope, to further this work. People making their own energy, heat, hot-water, electricity - all from the sun. The basic component parts are available cheap enough for poor communities to pool their resources and take the first step. One panel to heat water, one module to charge a battery or to pump water to the garden or a shade/green house to allow local food production and growing season extension. As they can, more steps are added, and self-sufficiency is approached. A small funding base can allow many communities that cannot as yet, take the first step, and start a local solar-learning program. We are making 30W, 65W and PV cell phone charger modules in workshop settings, with inexperienced workers; 4th and 5th graders in rural Maine are making small PV battery chargers that can be placed in their windows to recharge the batteries we so often throw away; local compasinos in Nicaragua, many are land-mine victims, delivering locally produced solar PV modules, on bicycles, to remote village clinics and homes, for battery systems to light the night, or pump water, from river and well, to garden; orphans in Mali, W. Africa, and in India, and other developing world countries, have started their own business, manufacturing and installing PV modules locally. The 2012, Cinema for Peace Award winning film "Burning In The Sun" chronicles the start of one business, AfriqPower, in Mali, W. Africa, with Dr. Komp, Carolina and Daniel, working with Skyheat Associates! The technology is here, made available a step at a time, for us here in the U.S., handicapped and not able to achieve or not able to afford the required resources needed for the "rebates and tax credits", offered by the utilities and state energy offices. Many folks, motivated by the past oil-crisis of the 70's, established "off-grid" communities and homes, that now function as self-reliant, solar powered learning centers. The current oil crisis and Global Warming awareness, has re-newed the interest of all the world inhabitants! These facilities can expand their activities, inviting more families to learn and share the experience of living a more self-reliant lifestyle. Each time there is a solar workshop producing another solar apparatus to help someone live more self-reliant, another person or group in the area becomes motivated and empowered to "take the first step!" This do-yourself-solar approach, an over-all plan to help those with the least, will grow, slowly, to allow more and more, the experience of taking a step toward a self-reliant lifestyle, paving the way for a world at Peace, without the addictions we all suffer. "One step at a time - Do-yourself-solar technologies", could grow into the wave that changes the way we live! We can do it. We are doing it. We need others, motivated for change in their lives, to get involved with do-yourself-solar. Contact us, thank you. ------------- See CONTACT US page for info on solar workshops, Community Land-trust development and form for communication, with links to web-sites. 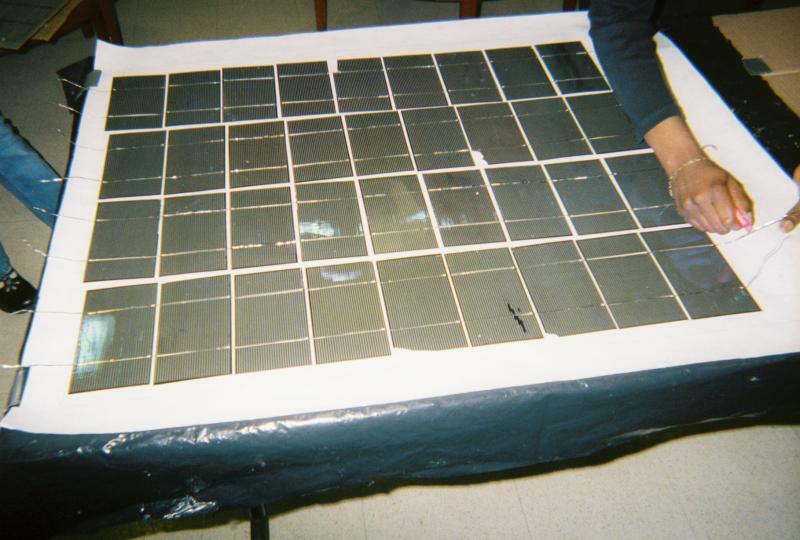 A finished, 65w PV module, Harlem, NY, ready for testing 2007. Can unemployed and disabled folks in the poor counties here in the USA, get together and assemble PV modules for use by their communities ? Is there a way that community members can achieve energy self-sufficiency without having the funds for the huge outlay required for a solar PV array ? for more on this growing phenomonon for communities like yours ... this may be a direct link to CPN and Emily ! Please let us know how this works and how we can help ! 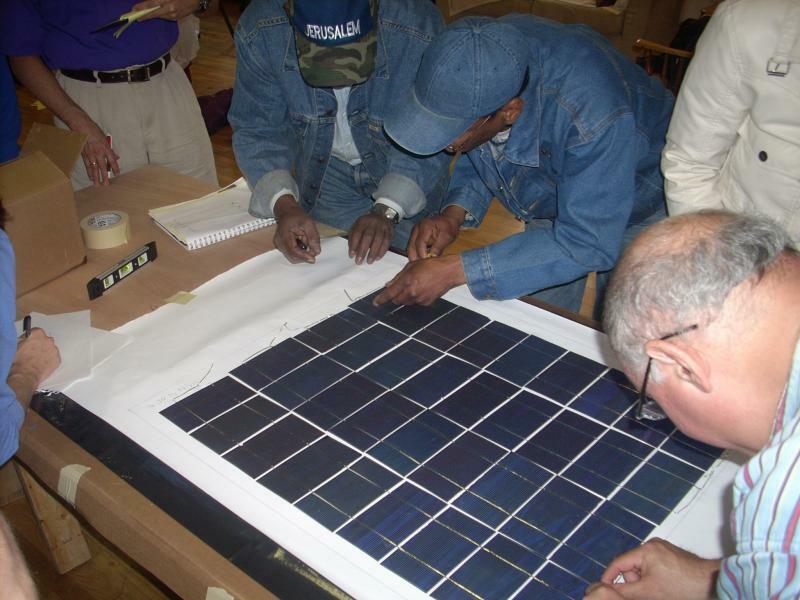 MESEA and DADS, are interested in getting folks that have the time to get involved with a SOLAR "Workers Co-op", with the goal of assembling PV modules for our community and our neighbors ... The need is here for jobs ... we all know ... Now is the time to get together and provide each other with answers ! Check into the 'Contact Us' page for communication form ... Co-op, Land-trust, and solar workshops... thank you ! March 15, 2013 - Fifth annual MESEA PV Workshop, Manhattan Comprehensive Night & Day High School, NYC ! Fifteen students, two visitors, the advisor David and the director Margaret, pose together with the 65 W PV module assembled with the class during the fifth annual MESEA Solar Workshop, at the MCNDHC, NYC, March 2013, presented with Downeast Alternative Design Solar, John Burke ! 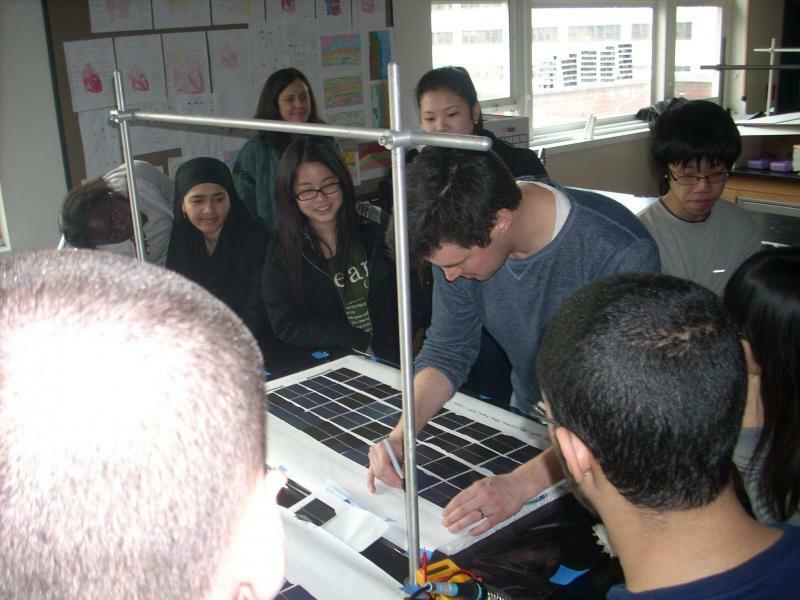 -------------------------------------------------------------------------- The students at the third annual PV assembly workshop series, at Manhattan Comprehensive HS, NYC, put their names on 30W PV module, March, 2011. This PV module will be used to pump air through a compost tea apparatus in the NYC Park next to the high school. Solar module assembly workshop participants, prepare to solder a string of cells for the 65W PV module, at the Brooklyn Commons, NYC. 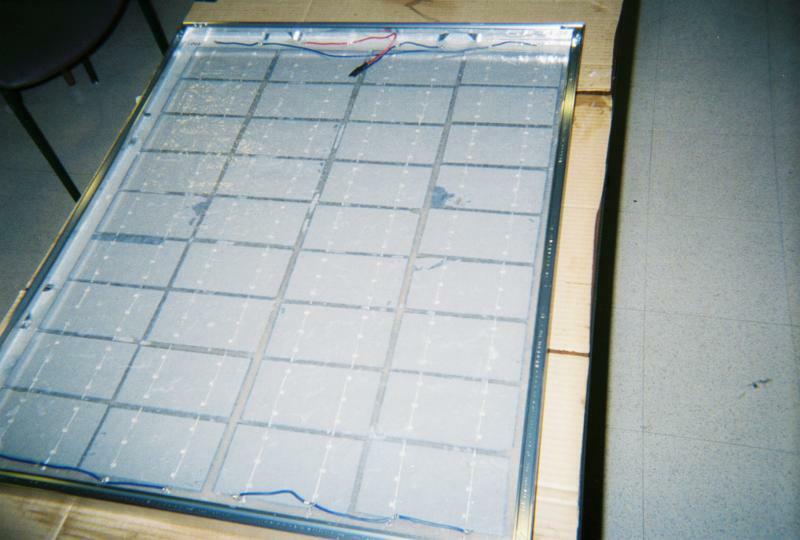 Four strings of 9 cells, will produce power for the 12V PV system, for a roof-top garden fountain, April, 2011. After the strings are soldered, the participants set up ribbons for final soldering. These are in position for liquid silicon encapsulation. This module will be used at the workshop site, to power the roof-top garden fountain and irrigation system. April, 2011. Dads, Inc.! Downeast Alternative Design Solar, is a non-profit Educational Corporation, Maine, and now with IRS tax-exempt status, donations are tax deductable ! Members of Dadsolar, (Downeast Alternative Design Solar), pose with Environmental Award Certificate, October, 2010, at Downeast Museum of Natural History. Richard Komp, Jerry Blackburn, Walther Wefel and John Burke, L - R.
Jonesport, Maine... Solar Home. DADS / MESEA PV assembly workshop participants, Erika and Sharon, get the feel of soldering solar cells for solar PV strings, to be used in a 65W PV module, 3 strings of 11 cells, October, 2011. Distinguished workshop participants, pose with glass capped, encapsulated 65W module. Jonesport, Maine, solar PV workshop, Oct. 2011. Low-tech, "heavy-duty" lamination, weights, used to help force the air from encapsulated 65W PV module. This module was assembled at DADS / MESEA PV workshop, Jonesport, Maine, Solar Home, Oct. 2011. John Burke, of DADS, and two participants with finished 65W PV module, (3strings x12 cells), on Solar Home deck, looking out towards Indian River, Gulf of Maine and Atlantic Ocean. MESEA PV assembly workshop, Jonesport, Maine, Oct. 2011. DADS, Inc., members are dedicated solar and alternative energy enthusiasts, each with well over thirty years experience, developing do-yourself-solar technologies. We have participated in thousands of seminars, workshops and educational forums around the world. There is a re-newed enthusiasm from folks we have spoken with during our past encounters, and an increased interest in Do Yourself Solar, as the oil crisis and Global Warming become more evident. We look forward to the next steps, and additional learning facilitators, to help spread the message of self-reliant life-style changes, stressing solar, wind and alternative energy, establishing solar learning community centers wherever the need exists. A National Energy Plan based on renewable energy is a priority! 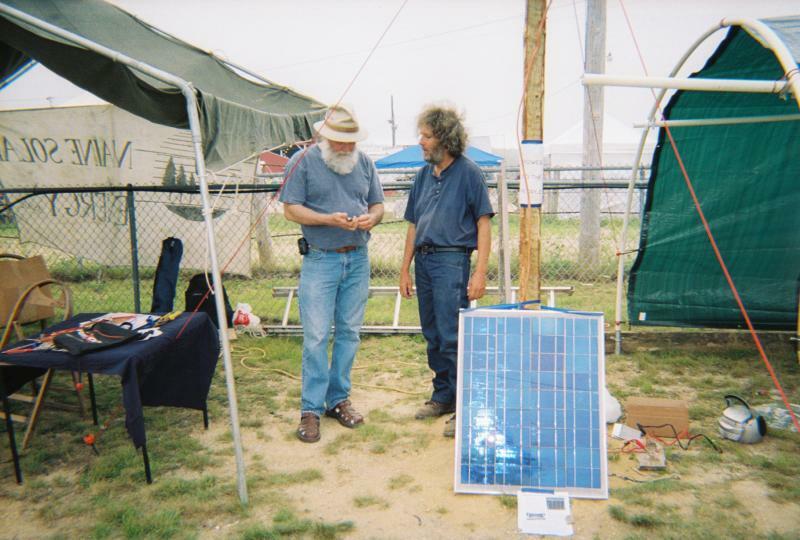 Here, John Burke and Walther Wefel, discuss the use of a 65W PV module, assembled at the ARC facility, Harlem, NY ... at the Full Circle Fair, Maine, 2008. 2019 ! - SEADS, non-profit educational Corp. in Columbia, Maine, has refocused their energy on establishing the Community Land Trust, for a limited number of Solar Homesteads on the 60 acre property ... ! FB has endeds the 'on-line' fundraiser, but use the email form on the 'Contact Us' page to send comments and questions. Thank you! Here, is the info from the recent brochure, featuring full time and time-share opportunities : call John, 207-546-1639 for more info, this summer ! Have you dreamed of going ‘Back To The Land’, but don’t know how or where to start ? There’s 60 acres on the Harrington River in Downeast Maine, waiting for a ‘Land Trust’ to be formed with like-minded folks. This property is already owned, free and clear, by a non-profit, solar educational corporation. There are structures… a Community Seminar Center with attached Pole Barn, and a separate dwelling / guest camp, on land bounded by a river and a stream, on a paved town road. The vision is for 4 or 5 more energy-efficient solar homes, each on a ‘life-lease’ piece with shared gardens and wood lot. A Community Land Trust with YOU in mind! our vision, your future, your home ! Contact us, soon as you can imagine! See the CONTACT PAGE for seminar info and links.